The Bentway is a new public space designed by PUBLIC WORK and Ken Greenberg located underneath Toronto’s Gardiner Expressway. 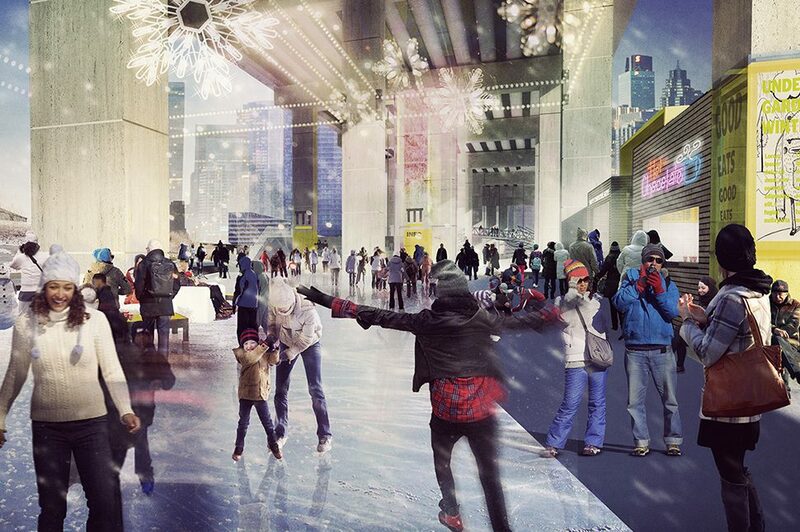 In early January we opened the first section of The Bentway to the public, including our new skate trail and an accompanying winter public art program entitled “Constructions of the Everyday.” Both the design of the space and the artists involved in our winter season radically re-imagine familiar everyday structures. For over sixty years the Gardiner has been a defining feature of Toronto’s urban landscape. The 18-kilometer concrete structure stands tall as symbol of its time – functional in nature, monumental in both scale and ambition and built to achieve single-purpose, car-centric planning objectives. In a radical act of renewal, The Bentway turns underutilized land into an active corridor and utilitarian into a new site for gathering and leisure. The Bentway compels us to re-confront the familiar and find exceptional opportunities in the most common and recognizable of spaces. The winter season public art program at The Bentway, “Constructions of the Everyday,” features a winter village designed by + tongtong and works by Jennifer Ilett, Jimmy Limit, Janine Miedzik, PA System and Embassy of Imagination, and Public Visualization Studio. Embracing the same spirit of transformation and translation the artists and designers featured in “Constructions of the Everyday” ask visitors to find new value and beauty in the structures of everyday life. Employing mundane materials, utilitarian objects and routine activities as subject matter, their work transcends expectations and explores the expressive qualities of these traditionally mute features and routines. Both the design of The Bentway itself and these works implore us to question singular and static definitions, and instead, to look at our environment and its infrastructure through a different lens in order to see our city and ourselves anew.